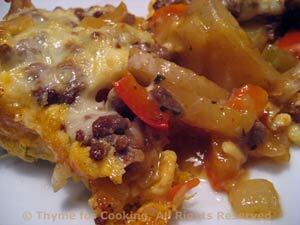 Easy Dinner from Thyme for Cooking: Crustless Cheesy Beef and Potato Pie. We'll be using 8oz (240gr) in the meatballs on Thursday, so you can get a bigger package and freeze half. (But you already know that...) As everything is cooked before going into the oven it's just a matter of melding the flavors and cooking the eggs to bind it all together.